The Huawei Mate X is a folding phone pioneer. From our hands on time with the device it not only definitely proved that folding phones are far from a gimmick, but it also genuinely wowed us with its build quality as well as fit and finish. The Mate X is genuinely exciting to hold in the hand, and for that Huawei must be congratulated. However, naturally, no judgement can be bestowed on the phone until we get chance to extensively test the device, as its incredibly high price will almost certainly not be the only obstacle it will need to overcome to win our approval. Welcome to T3's early verdict Huawei Mate X review. We reviewed the Huawei Mate X 5G folding phone live from Mobile World Congress 2019 and, as well as covering the dramatic Huawei Mate X event reveal, T3 went hands on with the hot new 5G foldable device so we can pass on our immediate thoughts. We also spoke directly to Huawei Executive Director Richard Yu about the Huawei Mate X in a detailed and revealing interview, too, so be sure to check that out once you've perused this early verdict review. Naturally, our fully scored Huawei Mate X review will follow as soon as we can get our hands on a unit and undertake some long-term, rigorous testing. Here, though, we explore the device and see how it stacks up against the other folding phone that is been spoken about right now, the Samsung Galaxy Fold. We've assessed the Huawei Mate X on a number of key criteria, ranging from design and build quality, through screens and hardware, and onto camera system and features. We've also got all the information released so far about the Huawei Mate X price and Huawei Mate X release date, too, as well details from UK networks. The Huawei Mate X foldable phone will cost €2,299 (that's about £1,997) and will ship in the second half of 2019. The phone will be available directly from Huawei through its online store, as well as from a selection of online retailers and networks. In the UK, Vodafone and EE have confirmed plans to sell the Huawei Mate X. The core internal hardware of the Huawei Mate X is located in its vertical sidebar. The first thing you notice when you pick up the Huawei Mate X is the vertical bar that runs down its side. This bar not only holds the device's Leica-branded triple camera system (more on that later) but also houses the Mate X's power button/fingerprint scanner and internal hardware. That internal hardware includes Huawei's flagship mobile processor, the Kirin 980, as well as 8GB of RAM and a 512GB storage drive – expandable by a further 256GB thanks to Huawei's Nano Memory. As the Huawei Mate X is not just a foldable phone but also a 5G one, the sidebar is also the location of its quad antenna-connected Balong 5000 5G modem, which is the crucial component in delivering its claim to the title of "world's fastest 5G phone". The Balong 5000 allows the Huawei Mate X to boast a "Sub-6G" downlink speed of 4.6 gigabits per second, which is approximately ten times faster than 4G. Unfortunately, we didn't get to test out this speed during our time with the device as there was no 5G network, but Huawei has noted that this sort of connection would, for example, allow a user to download a 1GB movie in just three seconds. The mix of these powerful internal components translates into a very rapid and slick experience on the device. Apps loaded immediately, screen transitions were not accompanied with any flicker of a delay and, most impressively, multitasking on the phone's huge screen real estate seemed to have zero effect on its performance. Simply put, the Mate X felt like a modern flagship phone in core performance, just one that sports a new folding screen design, too. In tablet mode the Huawei Mate X's FullView screen is 5.4mm thin. And, talking of design, our early impression is that Huawei has won the first-generation folding phone war over Samsung and its rival Galaxy Fold. And let's not even mention the Royole Flexpai. As we will see further down this Huawei Mate X review, the design the Chinese maker has chosen really allows each of its three screens to be shown off and used to their full extent, with three large displays allowed to breathe. When you compare the 4.5-inch Cover Display on the Samsung Galaxy Fold to the 6.6-inch or 6.4-inch phone-mode screens on the Huawei Mate X, the size difference seems very apparent and, with the industry currently moving more and more towards large-screened devices, the Chinese brand seems to be more on-trend in this instance. The Huawei Mate X's screen is locked in position when in phone mode via a buttoned clip. When folded, the Huawei Mate X has two distinct screens – an edge-to-edge display on the front, and a slightly smaller display that sits side-by-side with the sidebar on the rear of the device. The former measures 6.6-inches with a 19.5:9 aspect ratio and 2,480 x 1148 pixel resolution, while the rear-facing screen is 6.38-inches with a 25:9 aspect ratio and 2,480 x 892 pixel resolution. When the folding screen is completely unfurled it becomes an 8-inch "FullView" screen with 8:7.1 aspect ratio and 2,480 x 2,200 pixel resolution. All three of these screens are crisp and bright. However, there's an irritating iota of spongyness when pressing on the FullView display. We were very impressed with how the device displays content and transitions both physically and in terms of software display between modes and orientations. The Falcon Wing hing is, without doubt, one of the most neat pieces of small-scale mechanical engineering we've seen recently at T3 and it makes bending and contorting the Mate X's screens a very reassuring experience. One of our biggest fears with this first generation of folding phones was that the necessary hinge and fold would end up betraying the rest of the hardware package, so it was really nice to see that Huawei had made this a non-issue right off the bat. In terms of the actual fold area of the screen (where the screen bends), we could see no obvious crumpling, warping or discolouration. Huawei says the folding screen and hinge mechanism have been tested up to 100,000 bend transitions and, well, no sane person will ever exceed that number of bends during the lifetime of the device. When fully unfolded in tablet mode we can also confirm that, as Huawei indicated with its bolshy call out during its MWC 2019 event, at just 5.4mm thick it is very thin and light in the hand. When folded, too, despite noticeably being thicker than a normal smartphone, at 11mm did not feel unportable or compromised. A USB Type-C port is located on the bottom of the Huawei Mate X's sidebar/ergonomic grip. The Mate X's screen locks in place when in phone mode with a clip keeping it firmly flush to the back of the phone. Equally, when you want to transition the screen into tablet mode you need to press the button clip to free the screen from this constraint. Naturally, where content looked best, though, is when displayed on the combined might of the 8-inch tablet FullView display, which largely thanks to Google's now very adaptable and versatile operating system displayed apps, videos and the system's user interface just wonderfully, with a iPad Mini-style experience enabled all of a sudden with one swift screen transition. A look at the rear of the Huawei Mate X reveals the location of its Falcon Wing hinge. The one thing we still don't know much about from our hands on Huawei Mate X review session is its camera system. It is a Leica triple-module system and, as the screen can bend right round when in smartphone mode, all of those cameras are technically on the rear of the device, although they all point forward when the phone is fully closed allowing them to be used for selfie shots. Naturally, this means there's not a front camera on the Huawei Mate X and, despite us not being able to test this, all selfie images should be a much better standard than we're used to as rear camera lenses are always superior to their front-facing siblings. If we were to make an educated guess here at T3, considering the Huawei has confirmed the camera will as least as good as that installed in its current flagship phone, the Huawei Mate 20 Pro, and that its upcoming flagship event is just around the corner, then the Mate X's camera system should be very similar if not identical to the one installed in the Huawei P30. While we still think it is pretty bad form here at T3 and just not cricket to take photos via tablet (and especially so in crowded environments where views can be easily blocked), we can see how it will make taking images in certain circumstances easier through the Mate X in tablet mode. That large 8-inch view finder really lets you view in detail the full scene prior to shooting. Naturally, we will withhold judgement until we can test the Mate X's camera system in detail in our full Huawei Mate X review. In terms of battery, the Mate X packs a hefty 4,500mAh unit, which is technically split over two cell banks in either side of the phone. That is more juice than the Samsung Galaxy Fold on paper but, with so much variance between the two devices, its hard to estimate which will last longer. It's also hard to guess just how long the Mate X will run for on a single charge, as all those screens are guaranteed to munch through battery life quicker than just one. To be fair, though, with the Mate X supporting Huawei's 55W SuperCharge tech, which apparently allows it to be recharged from zero per cent to 85 per cent capacity in just 30 minutes, that won't really be an issue providing you have a power socket on hand. The small bezel AMOLED screens on the Huawei Mate X look top draw. 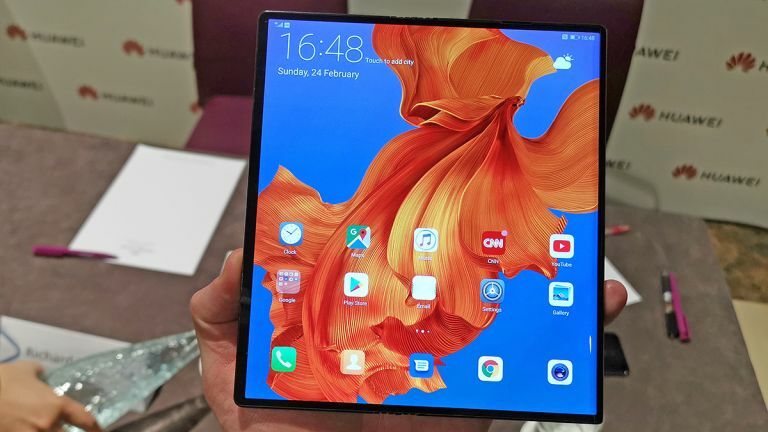 Coming after the very hands off Samsung Galaxy Fold reveal, which impressed but left a sense of distance between the device and the commercial market, the very strong Huawei Mate X reveal at the Chinese maker's MWC 2019 press conference seemed to push the foldable phone future even closer to reality. Despite this, though, many questions remained, and foremost among these was whether foldable phones were an expensive misstep by the industry that would come and then go again once 5G bedded in across the mainstream commercial market. But going hands on with the Huawei Mate X was a genuinely enthusing experience and one that well and truly proves that folding screen technology in our mobile devices is something we should be very, very excited about. The build quality on the Huawei Mate X is incredibly premium and high-end, the multi-screen folding display technology is state of the art, and the user experience seems incredibly slick and well thought out. Using the device at Mobile World Congress was very, very intuitive and for that we feel Huawei must be congratulated. Operating the Mate X felt very similar to a regular smartphone experience, just with added and very neatly integrated extra hardware and features that could be called on if desired. The Huawei Mate X is one of the very first folding phones to come to market and, naturally, because of that pioneering status and cutting-edge tech, the phone is incredibly expensive. But, as we say quite often on T3, if you want the absolute best, most cutting edge technology, you have to pay for it. It's obviously not for the vast majority of users right now but, and this is the crucial takeaway from our hands on time with the Huawei Mate X, we can definitely see how it could be once the necessary R&D over the next couple of years brings its entry cost down to current flagship phone levels. It's accessibility, quality and convenience, packing both smartphone and tablet functionality in one device, definitely will appeal to far more than tech enthusiasts and, in partnership with the power that 5G networks will have in transforming how we use our personal mobile devices, we think that is something to get genuinely very excited about. April 12, 2019: Huawei Mate X will make its way to British shores later this year, mobile network Three has confirmed. The carrier has confirmed that it's on schedule to roll-out its 5G network in the second half of 2019 and that it has already "partnered with Huawei to bring their 5G phone to our customers", including the Mate X. The mobile carrier confirmed its plans to the team at TechRadar. It's unclear whether the Mate X will be exclusive to the network. Those who want to get their hands on the Huawei Mate X from Three, or any other UK networks that decide to carry the smartphone, will likely have to cough-up a serious chunk of change. Huawei has confirmed a SIM-free price of €2,299 (around £2,000 converted), which is likely to result in some eye-watering monthly contract prices, or hefty upfront costs at the very least. We'll keep you posted.